Paul Rodney Turner was born in Sydney, Australia in 1963 and grew up in the Western Suburbs of Sydney. From a very early age, he became interested in astronomy, astrology, numerology, billiards and graphic design. At the age of 19, Paul left home to live a reclusive life in Sydney’s Blue Mountains. At this time, he met Jain 108, a budding astrologists, artists and sacred geometrician who was fascinated with magic squares. Jain peaked Priya’s curiosity with magic squares. Soon after, Paul joined an ashram to become a bhakti yogi and took a vow of celibacy. For the next 14 years Paul, now known as “Priyavrata das” — or “Priya” for short — by his fellow Vaisnava monks, studied the ancient teachings of the Vedas as taught by His Divine Grace A.C. Bhaktivedanta Swami. 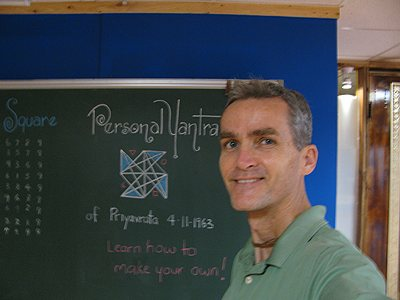 During this time, Priya furthered his interest in the mystical arts of numerology and sacred geometry. Over the next 28 years, Paul traveled to more than 50 countries throughout Europe, Asia, and the Americas, helping to inspire and set up Food for Life vegetarian food relief projects and train volunteers. In 1994, Priya wrote the official Food for Life training manual and in 1996 he wrote, sang and produced the first official FFL music CD called Prasada Sevaya (Service to holy food). It is no surprise that a fascination with geometry and numbers parlayed into Paul’s contribution to the world of billiards with the invention of the world’s best aim trainer, The Billiard Aim Trainer (BAT) in 2006. Paul is currently traveling the world sharing his wisdom and experience, while he continues to serve the charity, Food for Life Global, teach Food Yoga, and hone his intuitive skills to better serve his clients with accurate numerology readings and inspired designs. If I have done free service or helped you in some other way and you feel inclined to reciprocate, you can either gift money through Paypal or purchase something from my Amazon Wish List. HAVE YOU EVER FELT POWERLESS? HAVE YOU EVER FELT BELITTLED? Feelings of mediocrity or failure are all symptoms of false ego - a false identification with your outer shell. SOUL POWER is here to set you free from the illusory shackles created by a mischievous mind. In your hands you hold the secret to happiness, peace and prosperity.